It's something of a "Friday movie night." If it wasn't $11, I probably would've added "OxyMorons" that's playing at Revere's Showcase Cinemas. There's good article in The Phoenix about the Charlestown guy who lived the drug/crime life and wrote a movie that makes "The Town" look like a G-rated comedy. Two classic French New Wave classics by Francois Truffaut for less than it would cost to see a megaplex screening of a Natalie Portman-Ashton Kutcher romantic comedy. Next weekend, there's a Ingmar Bergman double-feature followed by an Orson Welles double-feature. Unless you actually spend a full 4 hours, it's doubtful that you'd get to all of the approx. 50 artist studios. Go in a direction or pick a floor or just wander around until you see something you like through the open door. The interesting thing about this thriller where a cop who hates Asians and is trying to clean up NYC's Chinatown is that director Michael Cimino could continue to make stylish, ambitious films even though they wouldn't make a lot of money. He made some good movies after "The Deer Hunter", but he may be better known in some circles for his subsequent box office bomb "Heaven's Gate". It seems like directors don't get a chance to fail big anymore unless there's enough CGI to still make money. He should be in attendance tonight where he'll hopefully talk about his storied career like working with Mickey Rourke, Oliver Stone, Clint Eastwood, etc etc. It's too bad this screening missed the Year of the Dragon by a couple days, but it looks like you can still reserve seats for free. In case I forget, there is free cinema at the Modern throughout the month. Before "Lisztomania" (the pop song) and "Lisztomania" (the movie), there was genuine Lisztomania for the Hungarian pianist-composer who wowed 19th-century Europe with his virtuoso performances. It's reasonable to assume that his compositions can be quite intense for subsequent pianists to perform. This year is the bicentenary of his birth, so the NEC is presenting a series of concerts -- that continues next Friday -- where all of their piano majors as well as other students will perform. The theme of tonight's program are compositions while living in Switzerland. 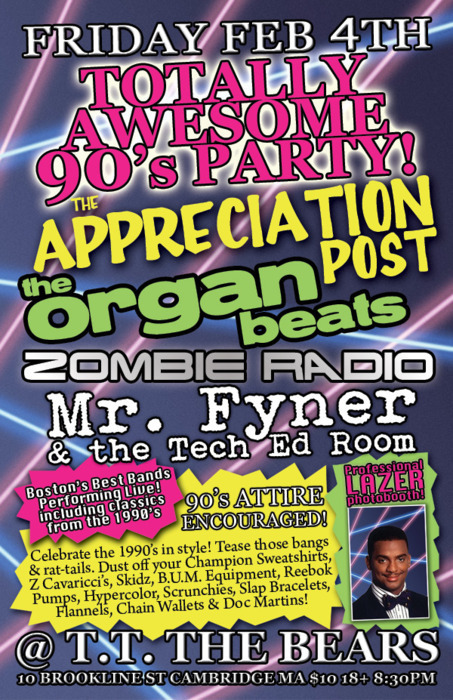 Yeah, it's a "Totally Awesome 90's Party". Everything becomes nostalgia after 20 years even if it sucked the first time around. Still this is a pretty killer lineup of powerpoppin', rockin' goodness who should each do a good job of throwing in a couple '90s tunes in their sets. Of course, there will be a photobooth to document your old-school look (or not -- apathy was in during the 90s). If you get there early enough, you could get one of the 100 free CD's from The Appreciation Post. Sweet! I'm amused by the idea of having a dance party and encouraging people to dress like ninjas. Is there not enough black attire at dance clubs? Or is this a subtly novel criticism of dancers adorned in dark colors? There's a lot of shoegazey and indie-rock goodness set to different levels. I like to see The Milling Gowns thrown in there for a little contrast; their guitarless "gloom pop" has an edge without being loud. Plus the Rosebud is a great place to hang out.